This is the first book of Irshad Mandji,a moslem feminist,reporter,human right activist and lesbian. I read the indonesian version which is consist about 233pages and divided in 9chapters. 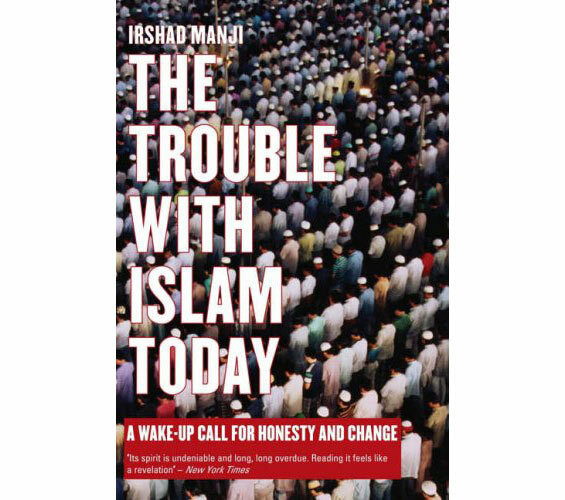 This books tells about troubles,problems and challenges that Moslem will face during nowadays and in the future. Starts from the background of the writer who born in moslem family in Uganda.after the political conflict they move to north America to get better life.she grown up in the Islam family,neighbourhood and school.it seemed she faces so much disturbances about she as a girl/women to fulfill her right in the community.she felt so much discrimination.and she found many other similar case of discrimination in women in many place that Islam is the majority.women being blocked for their rights and role under man control and position.same thing also happen in slavery treatment in Islam.it is allowed and legitimate by their religion leader (imam,mu llah,syekh) because the Quran said so. Enough?not yet.because many Moslem hardliners use these Quran as an excuse to hate,discriminate,bigotry and violence act to their ‘so called’ enemy which is Jewish..and Christian..
Do the holy Quran said so?maybe yes,maybe no.it depends of how we understand it and who will understand it.many contrary about anything appear together in Quran,the masterpiece of previous holybook that God send to Muhammad the prophet.somehow it shown it’s imperfect of perfectness.and lead into moment of doubting of the writer about the validity. Maybe there were mistakes of perception by the writer when Muhammad try to rewrite the verses?maybe there were mistakes when usman bin khaffan try to compile the verses in to a book? In other hand,Quran written in Arab.most of Moslem only read it without knowing the meaning.and when we try to explore it further,many conservative imam will strict on their perception and no good discussion. It is because the tribal matter.Islam ‘born’ in Arab,in the dessert.the language,tradition,cultures representing Arab.it such a pride.so some peoples will conclude tat Islam is as same as Arab.some people think that Arab is the purity of Islam.and with all this ego and pride to defend the purity will define Islam. Islam cultures improve well by the time goes on in many place and contribute many other things in civilization beside the religion itself.it produce science,philosophy,algebra,architect,medicine,art,etc.how come?by living peace and blend with the others,integrate.Jewish,Christian,European,Asian.they even allowed many Jewish and Christian to organize the Islam government.and there goes the glorious moment of Islam.tolerances and respect. But somehow it doesn’t suitable with the Arab stuff maybe and it lead to hatred,discrimination,intolerance in a very rough way.the writer give many example like Israel,Palestine,Islam in Cordova,Turki,Genocidal in Armenia,gulfwar,etc.the result?Islam being left behind by the others,poverty,less education. During it improve Islam split in many clan and sect,but the one who claim the real one is the purity one,Arab.the others is just betrayal,lost in faith and got even worse fate than their ‘so called enemy’..
syariah,the Islam law based on Quran.Islam well spread everywhere since longtime ago.by the time goes on,there should be many things that not suitable in present condition.and how we could make solution?ijtihad.an Islam tradition,an independent think to solve the problem that not exist in syariah.it need to gather,discuss and sound so democratic.it has different perception for the mainstream/fundamental/Arab who only known khilafah,one great leader without democracy. Ijtihad drive the writer’s spirit for keep in faith of Islam.she believe this tradition will be a new way to defend innocent peoples from sin and punishments of injustices of unsuitable law in present.especially for women. But this way of thinking will be wipe by the fundamentalist mainstream who not open.minded.and this way of thinking will easily being claimed as betrayal and kafir like other sect and clans. This closeminded will eventually turns into fascist and fatalist to Islam itself. Actually what drowned Islam is Islam itself.these fundamentalist-fanatic-fascist only think about hatred and how to wipe Jewish,Christian and kafir clan…the western,and Islam’s ‘so called enemy’ just try to take advantage. Every religion have their own bad agenda.it is also exist in Christian and Jewish but definitely not the mainstream.Israel is in a state to split their governmental and their Judaism.they actually almost secular.they still Arab people exist and live there.and most of them is mixed in Israel without problem(Jerusalem for exception).they even use Arab language as their second language.so? Maybe that is the book plot.how about peoples thought about lesbianism campaign in this book? Negative.i found not more than 10gay/lesbian word in this book. I agree about the ijtihad spirit but actually,religion is different with science.so when you studying religion,and try to explore it,no matter how positive the idea or not,it is quiet a same like the hardliner.could legitimate and legalize something for your own.advantage. In some points it was too overrated to doubting Quran and Muhammad.it was to naive also to think only Islam that looked most bad.i believe those idea exist in every religion,no matter how much it is. Women lead everything,even a country,it is not a matter.but to be imam in shalat?make sure the all of the jamaah are women and children, then it’s fine.